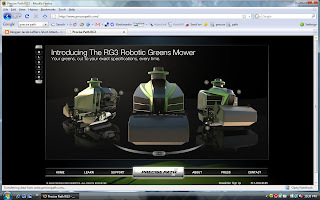 The Basement Design + Motion worked with client Precise Path Robotics to launch this web site and cg animations to help them introduce their new product - the RG3. Check it out and enjoy the experience. Jacob.LIke the site but have a concern. Yeah Bill thanks for checking in. We had our post mortem last week and basically it is asking you to update your version of Flash I believe. We used Flash 10 on this project because it gave us some opportunities for the site that otherwise would have not been available in 9. That being said, the down side is that there is a lower number of users for 10 than 9 at this point since 10 is still somewhat new. The age old question what do you do, create a lesser site or take advantage f the new version but introduce more users to the "download Flash 10 now" message. If it asked you to update more than Flash, then help me understand what it is specifically and I will address. Thanks again Bill and hope all is well.